Oct. 5, 2016 | LITTLE ROCK — Fellowship-trained medical oncologist Angela Pennisi, M.D., Ph.D., has joined the University of Arkansas for Medical Sciences (UAMS). She sees patients in the UAMS Winthrop P. Rockefeller Cancer Institute and is an assistant professor in the UAMS Division of Medical Oncology. 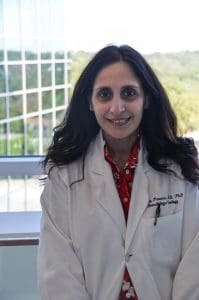 Pennisi earned her medical degree and doctoral degree in experimental hematology from the University of Catania in Italy, where she also completed fellowship training in hematology. After serving as a postdoctoral research fellow at the UAMS Myeloma Institute, she completed a residency in internal medicine at UAMS, followed by additional advanced training in the UAMS Hematology/Oncology Fellowship program. Pennisi is a member of the American Society of Clinical Oncology and the American Society of Hematology.